The Mad Hatter has moved to Hollywood! The Old Hollywood Gala is brought to you by the same great team that put on the Mad Hatter’s Garden Party, our 2018 inaugural, sold out event! Same team, new great event and theme! Currently 77 and acting since the age of eight, American Icon Richard Dreyfuss has had a string of instant classics from the 70’s – “American Graffiti”, “Jaws”, “Close Encounters of the Third Kind”, and “The Goodbye Girl” (for which he won the Academy Award for best actor). Other notable films include “What About Bob?” (1991) with Bill Murray, and Steven Spielberg’s “Always” (1986), as well as “Stand By Me” (1989), “Down and Out in Beverly Hills” (1987), “The American President” (1995) and “W” (2008); he was critically lauded for his role in “Mr. Holland’s Opus” (1985) which earned him another Oscar nomination. His roles in more than fifty films have collectively earned more than 2.5 billion dollars worldwide (not adjusted for inflation). Hailing from a politically charged family, Richard's grandmother Elsie witnessed the Triangle Shirt Waist Factory Fire as a child. Elsie ran straight to the Socialist Party Headquarters and signed on, eventually becoming private secretary to Eugene B Debs, America’s notable Socialist. Richard 's career shares time with his lifelong political concern for the education and inspiration of our youth. We are rolling out the red carpet to benefit kids with pediatric cancer! Laura Kruger, and Delinda Fatianow for this 2nd annual star studded event. Ticketing: Click here to purchase your tickets. Sponsorships: Click here or on each level below to view all sponsor levels and privileges. More levels coming soon! $15,000 Red Carpet Title Sponsor (Limit 1) - Includes two VIP tables for 20, and top tier recognition, including exclusive logo placement on napkins, the opportunity for a representative to speak on stage, banner placement, a dedicated e-blast featuring your business, placement of a full page ad in the program, and more. Click for more info. $7,500 Hollywood Boulevard Presenting Sponsor (Limit 2) - Includes two VIP tables for 20, and top tier recognition, including banner placement, a dedicated e-blast featuring your business, placement of a full page ad in the program, and more. Click for more info. $5,000 Rodeo Drive Sponsor - Includes a VIP table for 10 and top tier recognition, including placement of a half-page ad in the program, on stage recognition, and more. Click for more info. $3,500 Mulholland Drive “Entertainment” Sponsor - Includes a VIP table for 10, the exclusive opportunity for someone at your table to perform with the band, and other recognition benefits. Click for more info. $2,500 Sunset Boulevard Sponsor - Includes a VIP table for 10 and recognition benefits. Click for more info. Attire: Old Hollywood Glam/Vintage - Channel your inner Cary Grant or Marilyn Monroe and strut your stuff on the red carpet! Venue: The event will be held at the Seawell Ballroom at the Denver Performing Arts Complex, featuring stunning view of the city and located in the heart of downtown Denver. The Seawell Ballroom is located in the Helen Bonfils Theater Complex, at the northwest corner of the Denver Performing Arts Complex. Look for the marquee by the box office to enter. The event will include a special presentation of the “Life is Looking Up” award to honor the memory and legacy of Noel Cunningham. It will be given to a pediatric cancer patient who has overcome unique challenges and persevered. Click here to learn more about Noel. All proceeds benefit the true “stars” of the evening - pediatric cancer patients and their families. 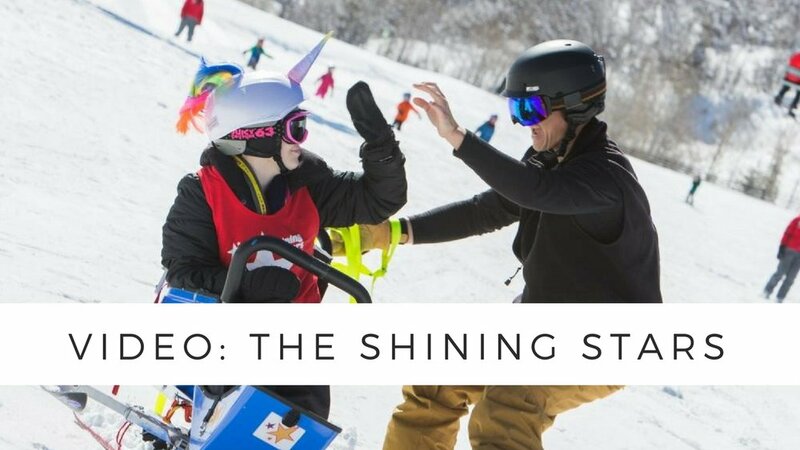 Your support will help the Shining Stars Foundation, a Colorado based charity, provide 70+ life-changing programs/events designed to give hope and strength to hundreds of families each year. Click the video below to meet the Shining Stars kids and see our programs in action. Introducing our Live Entertainment: The Flatirons Jazz Orchestra! Bring your dancing shoes and enjoy the 18-piece, big band experience of the Flatirons Jazz Orchestra. The Flatirons Jazz Orchestra authentically recreates the great Swing Era Big Band Jazz of Duke Ellington, Benny Goodman, Count Basie, Glenn Miller, Ella Fitzgerald, Billi Holiday, Buddy Rich, and other jazz royalty from the late 1920s though the early 1950s. You won’t want to miss it!